Outwit villains and break an evil curse! 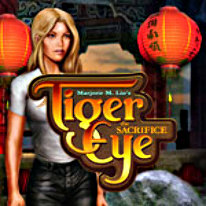 Outwit powerful villains and break an evil curse inflicted upon your love in Tiger Eye: The Sacrifice! In this adventurous romance, you and your love, Hari, have escaped pursuers in China and arrived home to California. Once there, however, you find that your enemies are closer than you think. Now you must track down your best friend, whose life depends on you!